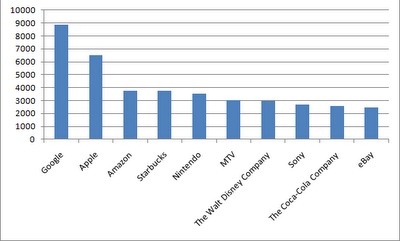 Every now and then we get some battle of the brands research to talk about. It's usually a PR stunt by either a brand consultancy or a research company. I still like peeking at the results though. Recently, I've been playing with GetGlue as a way to enjoy some social media/algorithmic reading suggestions. It's early days but the signs are good. GetGlue also lets people like brands and companies. It's not a big part of their offering but it's there; tucked away inside "topics". I noticed it first on their Android application. I thought it would be fun - and perhaps more scientific than some of the brand surveys - to see which where the top 10 "liked" companies. GetGlue makes this easy for by providing a list that's nearly in order. I think, inside GetGlue, a subscription to a topic weighs more than a whole bunch of likes. This chart, though, as been ordered just be likes.